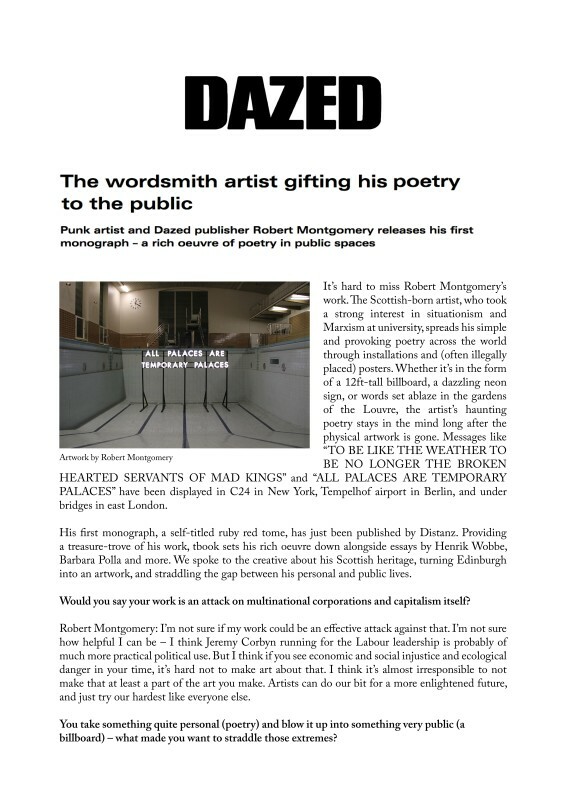 Punk artist and Dazed publisher Robert Montgomery releases his first monograph – a rich oeuvre of poetry in public. It’s hard to miss Robert Montgomery’s work. The Scottish-born artist, who took a strong interest in situationism and Marxism at university, spreads his simple and provoking poetry across the world through installations and (often illegally placed) posters. Whether it’s in the form of a 12ft-tall billboard, a dazzling neon sign, or words set ablaze in the gardens of the Louvre, the artist’s haunting poetry stays in the mind long after the physical artwork is gone. Messages like “TO BE LIKE THE WEATHER TO BE NO LONGER THE BROKEN HEARTED SERVANTS OF MAD KINGS” and “ALL PALACES ARE TEMPORARY PALACES” have been displayed in C24 in New York, Tempelhof airport in Berlin, and under bridges in east London. His first monograph, a self-titled ruby red tome, has just been published by Distanz. Providing a treasure-trove of his work, tbook sets his rich oeuvre down alongside essays by Henrik Wobbe, Barbara Polla and more. We spoke to the creative about his Scottish heritage, turning Edinburgh into an artwork, and straddling the gap between his personal and public lives.